New Orleans We’re way across the line now. The place where we could have just shrugged and said it’s all just politics was many miles ago. 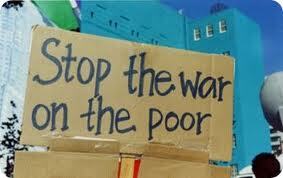 I’m not sure what it is but the Republicans have plain and simply declared war on the poor. It’s not just that they can’t stand them. It’s gone way past that. They are trying to kill them off now. When you look at the Simon Legree efforts to take food away from the poor by eviscerating the food stamp or so-called SNAP program, it is impossible to escape this conclusion. The Administration started the ball rolling with an unconscionable cut of $4 billion over 10 years, even while we’re reeling from the recession still. The Republicans took that and went 10 times worse by concocting an amendment going to vote now that would take off $40 billion over the same period and push 2 million people off of food assistance. Their view is “what recession?” it seems. An individual would be barred from food stamps in their proposal after 90 days if they were between 19 and 50 years old and didn’t have a job. They could get unemployment, but not food stamps! What dark place these folks are living in. It’s these Republican Congressmen who should be unemployed! And, if they can’t starve the poor, they want to take away any hope of health care. Once again Republicans in the House want to see if they can shutdown the government by holding the American people hostage to their quixotic effort to try and defund the Affordable Care Act or Obamacare as they call it. Reports indicate that 80 of these scalawags have hijacked House Speaker Boehner on this crazy deal where they promise they will not extend the debt ceiling unless ACA is defunded. We run out of debt in mid-October. No one thinks this is smart. It can’t get through the Senate. What the heck? All of this is in the wake of daily reports about the widening gap between the rich and poor. The average household income of a little more than $51000 is the same now as it was 25 years ago in 1988. In a place like Manhattan in New York City the income gap is the widest of any county in the country with the bottom 20% of the population averaging less than $10,000 in household income and the top 20% averaging $389,000 with the top 5% hitting about $800,000 for the family. You wonder why Bill de Blasio won the recent Democratic primary arguing that there are a “tale of two cities” rich and poor. When it seems everyone is realizing that the country’s riches have to be spread around, we have one of the major parties staking its reputation and politics on starving Americans and leaving them at death’s door by declaring a war on the poor? Who will stand with us against this attack? This entry was posted in Citizen Wealth, Financial Justice and tagged food stamps, SNAP, War on the Poor by Wade. Bookmark the permalink.